This soft, light, scented inflatable 8-inch Sponge Ball adds energy and excitement to any mat-based exercise routine. The Sponge Ball is perfect for enhancing core muscle activation, body-rolling techniques and postural re-setting activities. great price. great price. free shipping was key. I have been looking for more spri balls but kept finding very high prices. Allegro medical popped up on my search and I was pleased to see the great price and free shipping. They came before I expected and ready for my Monday morning class. They are a little bigger than the ones I already own, which makes it good for clients of different heights and sizes. Was introduced to this product in an exercise class, and wanted one to use at home for those days i can't make class but still want to do those lower ab workouts. I am 57 years old and as many women my age am fighting the ab / waist battle. I truly believe that using the sponge ball has helped me with my lower abs and as well my lower back. Good deal on a quality ball. Is the ball shipped Inflated or blown up? Whats a sponge ball? it inflates but apparently it remains soft to the touch? Anyone? Like the Physique 57 Ball? can you use a straw to inflate it or a pump? 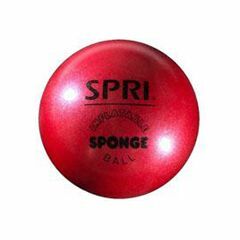 Sponge ball is an 8" version of the larger stability balls you see in many fitness facilities. It is a great tool to work the core. This is the SPRI version of the Bender Ball, which you can Google to see the exercises that you can do with it. yes but the air does not stay in ball many that were shipped loses air quickly after ball is blown up. Did not like this. Does this come with instructional excercise booklet. No,it does not. Nothing, just the ball. Answered on Nov 21, 2013 7:57:46 AM by Jandela from New Tripoli, Pa. The ball arrived in more than a timely fashion. It was here very fast--a couple days, max. Answered on Nov 21, 2013 8:00:46 AM by Jandela from New Tripoli, Pa.